In this series of diagrams by the Department of Product, give you the practical tools to build powerful products. Making decisions in your organisation about what to prioritise and what not to prioritise is one of the most difficult aspects of product management. Learn how to prioritise effectively and efficiently. Using powerful behavioural influencing techniques, learn how to create products which form part of your user’s every day lives so that you turn users into repeat users. Devised by Nir Eyal, The Hook Model provides you with tactics to get your users hooked onto your product. The Hook Model has 4 parts: the trigger, the action, the variable reward and the investment. The Hook Model can be used when developing new features and user stories, when putting together your product roadmap / strategy and when you’re collaborating with your UX / design teams on wireframes and user flows. The product strategy canvas explicitly plots your product’s features vs competitors to visualise on which dimension your product is different. List your competing factors vs. competitors in a table first using a scoring index and create a graph to visualise the differences. Devised by Strategyzer, the Business Model Canvas helps companies clearly articulate their business model. The canvas is split into several distinct sections which help to see your proposition in 1 page. The business model canvas can be used when starting a startup, before you test MVPs or when building a new product in a larger organisation to clearly describe the target audience / value proposition. The impact vs. effort matrix is used to assess the relative impact of one product feature / idea over another. The impact can be defined by you and your team. Impact for your team may be: alignment with your strategy, alignment with your OKRs or alignment with your value proposition. 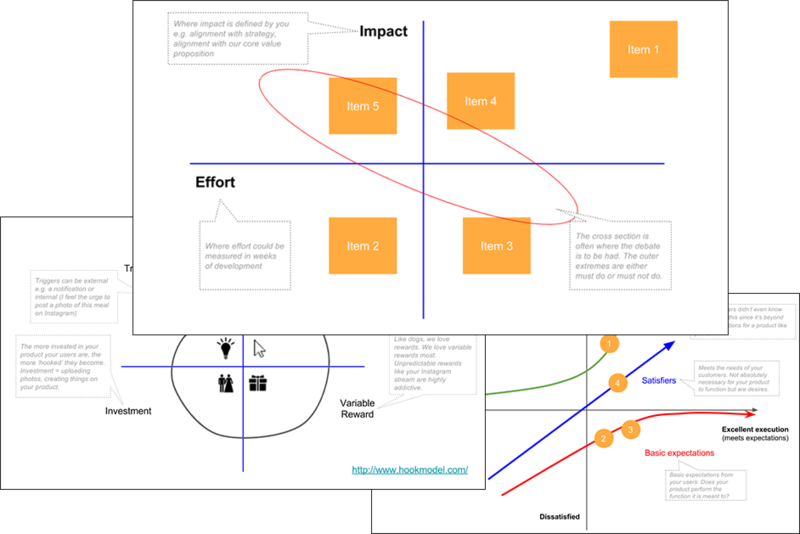 Devised by Strategyzer, the team behind the Business Model Canvas, the Value Proposition Canvas focuses exclusively on the value proposition of your business / product. Using customer jobs, pains and gains as the 3 core building blocks of value, map your current and future product to these 3 areas to assess how well your product meets your customers’ needs.